You can download the new app from the Apple App Store. Do you need a fast way to find your organization's maps? With Esri's new Explorer for ArcGIS app and ArcGIS Online or Portal for ArcGIS, you can visualize and interact with your geospatial information on your iPhone or iPad, anytime and anywhere. Explorer for ArcGIS is designed for anyone who needs to explore data in a geographic context and use maps to help make more informed decisions. 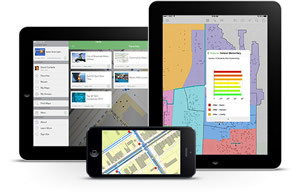 It is one of many Esri ready-to-use apps to access and use maps authored by you or others within your organization and share those maps on your iOS device. The Explorer app is straightforward and easy to use, so whether you are a seasoned GIS professional or have no prior GIS knowledge, you can become immediately productive using this app. For example, you can search for places in your map or information about particular assets within specific layers such as where assets are in relation to their current location. Quickly share that information with others via e-mail, text message, or platform-specific methods such as AirDrop (for iOS). Explorer for ArcGIS includes sketching tools that let you draw lines on your maps to highlight important aspects of your data. You can quickly identify and verify edits and communicate and collaborate with others easily. If you manage your city's public safety assets, for example, you can sketch and highlight which city water hydrants need repair and set priorities for the maintenance work. In another scenario you are a county assessor and it is your job to review property tax appeals on various land parcels. You locate the parcel map you will use for the appeals investigation and add it to your list of favorite maps. You examine the data in the map, sketch and notate the map, and share that information with others. In addition to sketching capabilities, you can also measure both distances and areas between points on the map and specify the type of measurement units displayed in your results. Explorer for ArcGIS lets you visualize and interact with your geospatial information on any iOS device. You can use interactive presentations in the Explorer app to tell stories and brief decision makers and other stakeholders within your ArcGIS organization. A map (that already has an authored presentation) contains a collection of slides that you can step through to review important information for yourself or present to others. The map is always live, so you can pan, zoom, tap features, view pop-up windows, and sketch on the map during your presentation. More capabilities will be added to the Explorer app in each consecutive release, including authoring your own maps, publishing and editing data, viewing maps in 2D or 3D, and authoring a presentation. The Explorer app will improve the way people plan and execute the work they do every day and use maps as a medium for presenting, sharing, and communicating with others inside their organization. Download the Explorer app from the Apple App Store. Anyone with an iOS device can download and try the sample maps included in the app. ArcGIS Online subscribers, trial users, and those with a Portal for ArcGIS account can simply download the app, sign in, and begin exploring their organization's maps. Support for Android and other platforms will be available in a later release.